Tofu versus Seitan: Taste, Texture and Nutrition. Tofu versus seitan. Both tofu and seitan are excellent sources of vegetarian protein. Tofu is made from soybeans. Seitan is made from wheat gluten. Both are easy to find in grocery stores. Tofu is the traditional vegetarian protein. But options like seitan and tempeh are becoming more mainstream-for very good reasons. I've already discussed tempeh, now lets discuss seitan versus tofu. Ahead in this post: a nutrition comparison, photos, and tips to help you judge the quality of your prepared tofu or seitan dish. Preparation makes a huge difference. Keep reading to find out whether you're best suited to being a seitan-lover or tofu-fanatic. Will I like Seitan or Tofu better? First question, do you like the flavor and texture of beef or tofu-jerky? Second, How passionate are you about eggs? And last, what are your mushroom preferences? Do you enjoy a thickly cut marinated mushroom? 1. Seitan is a chewy dense, almost beef-jerky like protein. It has the ability to be incredibly tender, yet still maintains that soft chewy quality-like real meat. If you are not a fan of a chewy texture like in a jerky, you may not like seitan. 2. Do you like eggs? The soft squishy fluffy yet firm bite of a poached egg? Or the spongy fluff of a scrambled egg? Tofu definitely tastes a big like an egg-in texture. I know a few friends who hate eggs, and thus also hate tofu. However, if you love that fluffy, moist, squishy-yet-firm texture of an egg, tofu will be pleasing to your palate. 3. Mushrooms. I ask this question because how you like your mushrooms may determine how you like your proteins. I personally love mushrooms any which way, and I love vegetarian proteins any which way as well. Mushrooms are super at absorbing flavors. Mushrooms like white button and portabella will absorb flavors. Tofu is an excellent flavor absorber as well. Left alone, tofu can be quite bland. But like a white button mushroom,- when infused with a seasoning, the flavor will pop. Seitan is a bit less influenced by the flavor. Like a sauteed shiitake or oyster mushroom, the complex texture always rumps the added seasonings. So if you like a taste/texture combo that is a bit more dense and complex, seitan might be for you. Now that you have a better feel of what protein might be more pleasing for your palate, lets take a look at the nutrition facts. Seitan versus tofu: Nutrition Facts. Depending on the brand and style of protein, the nutrition facts may change a bit. But you can see that seitan is actually a bit higher in protein and lower in fat than tofu. Naturally, tofu is a bit higher in fat and thus lower in total protein. You can buy low fat or higher fat versions of each. Seitan is an awesome high protein source of lean veggie protein. It gives you that "beef jerky" style protein boost. If you are craving a heavier, denser protein-go for the seitan. How Do I Judge Quality? Good tofu: firm, yet moist. Not rubbery. Flavor pops, yet tofu texture is still apparent. Fluffy like a perfect egg or angel food cake. A few spongy holes or texture marks can be seen. Not shiny after cooked. Does not fall apart on your fork. Bad Tofu: Rubbery, slimy, too dense or shiny after cooked. Can be cut with a perfect edge-no spongy bumps to the texture. Falls apart on your fork. Good Setian: Crisp, chewy edges with a moist tender inner part. Flavor should be infused through entire piece-not just edges. Correct ratio of chewiness to tenderness. Should easily pull apart in stringy moist bits. Not mushy or dry. Juices should explode in flavor when you bite into a good seitan. Bad Seitan: Dry-hard as a rock to bite. Overly cooked-too chewy. Mushy or 'melted' in texture. Unflavorful center. Not correctly seasoned. Mushy edges. Does not easily pull apart-or does not hold its shape well. Juices from bite are flavorless or bitter in taste. They are both winners! (In their own ways.) There are many reasons why people love their tofu, but seitan is the meat-lovers veggie friend. You really can't make tofu appear to be meat. But I have been to restaurants like Blossom, GoBo and Candle 79 here in NYC, and the seitan really looks and has a texture like meat! The texture has a meaty quality that really stands up to tofu-hating critics. 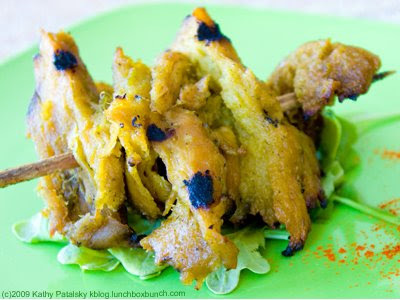 A meat lover could easily taste a good seitan skewer and be incredibly pleased. And the high protein really shines through the flavor. Tofu is an excellent option as well. I adore my tofu-pesto sandwich from Caravan of Dreams here in NYC. I get it at least twice a week. Also, at The Kitchen Club restaurant in Nolita, the tofu tastes like a fluffy block of tofu-angel food-egg-cake. My egg cravings are always subsided by tofu. However, if you don't like fluffy eggs, tofu might be too light for your palate. 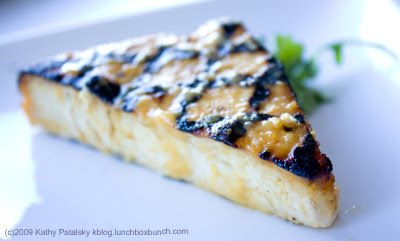 ...but then again, I have tasted a few densely grilled tofu steaks that really had a bold body and hearty texture. So never could tofu out even for the carnivores. The skills of the chef make a bit difference for how these vegetarian proteins turn out. It is very easy to mess up the flavor and texture of tofu and seitan. It takes a bit of practice and skill to make tofu and seitan taste their best...aka...delicious and irresistible. Both are cravable. Both will make your protein cravings healthy and happy.